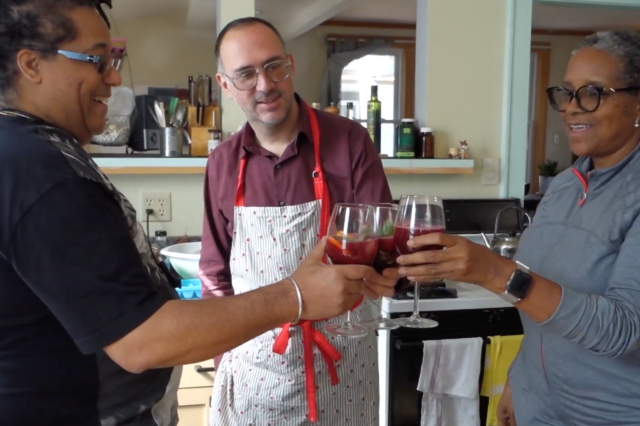 Milwaukee Kitchen is a new made-for-Youtube cooking program set in Riverwest, Milwaukee. Homemaker ChefD is busy in the kitchen, yet always has time for neighbors and friends. Those circles are growing now that the word is out. The program has been described as “Mr. Rogers for the 21st century cooking crowd.” Deep-rooted traditions like reverence for Ruth Berolzheimer and the “American Woman’s Cook Book” meet contemporary interest in hybrid flavors, resulting in a singular contribution to the eclectic history of human experiments with food and socializing. The heart of Saint Kate’s food and beverage program will be Aria Café & Bar. The all-day neighborhood café and restaurant, located on the second floor of the hotel, will specialize in simple, classic American cuisine handcrafted from the freshest, seasonal ingredients. Whether enjoying blueberry granola pancakes or house made corned beef hash in the morning, the return of the Milwaukee favorite Big Boy Burger for lunch, or sugar and spice crispy Amish chicken and shareable plates like charred Octopus with romesco for dinner, Aria will offer a friendly environment for socializing while noshing on humble, rebooted classics. The restaurant will also feature several select partnerships with local butchers, bakers, brewers and potters to celebrate art in all its forms. Just like the expressive melodies of an operatic aria, Aria Café & Bar will be a performance of sight, smells and flavors. Located adjacent to Saint Kate on Water Street, Proof Pizza will be Milwaukee’s newest neighborhood pizza joint – a pizzeria perfect for a quick lunch during a busy work day or a casual dinner before a performance. 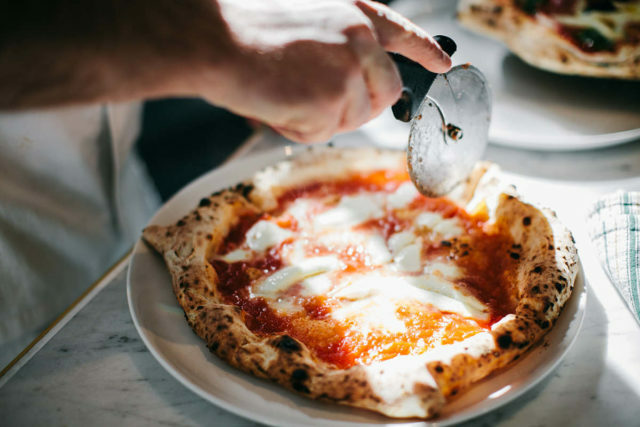 Inspired by the regional cuisine of southern Italy, Proof Pizza will be known for its specialty and build-your-own hand-made Neapolitan-style pizzas featuring 48-hour slow-rise dough and homemade tomato sauce, all cooked in under two minutes in a handcrafted 800-degree brick oven. Other menu items include Italian-style pocket sandwiches known as “tascas,” fresh seasonal salads, antipasti, playful desserts and other Italian classics reinterpreted with an artistic twist. Proof Pizza will also feature a simple and fun selection of imported and craft beers, as well as tasty wines. The focal point and primary gathering area at Saint Kate, “the Bar” will welcome artists of all stripes and walks of life to work and play around the clock. During the day, the Bar’s evocative collection of art and comfortable seating creates the neighborhood’s go to spot for work or casual pop-up meetings. Guests can sip on locally roasted coffee, fresh squeezed all-natural juices and cocktails, or nibble on house-made pastries. In the evening, the convivial space will transform into a vibrant, social spot, where guests and locals alike will mix, mingle and commune around the intimate bar while sipping cocktails made by expert craftsmen and experiencing pop-up sets from local DJs, performers and other artists. From the ice, juices and bitters made in-house, to “outside-of-the-glass” presentation, each hand-crafted cocktail will be created with the care and attention of an artist. 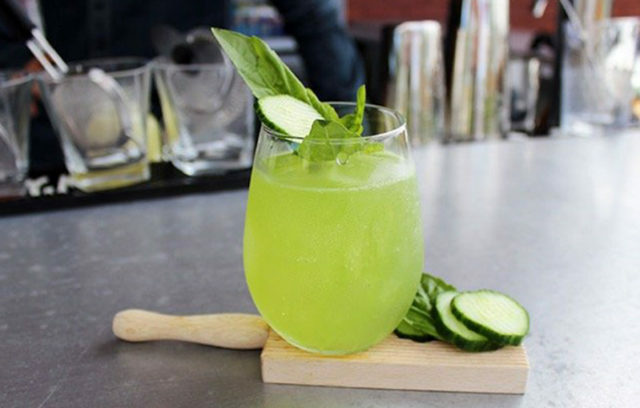 The Bar will also feature draft cocktails with shareable drink options, nitro cold brew cocktails, local craft beers on tap, a crowd-sourced beer can art program, approachable wines, and a special focus on non-alcoholic drinks. Guests will be able to enjoy bites from the Proof Pizza throughout the night. Also, for guests who prefer to enjoy a drink in the privacy of their room, the Bar will provide “Do it Yourself” cocktail room service. Also found on the second floor of Saint Kate will be “Giggly Champagne & Wine Bar,” Milwaukee’s first and only champagne bar. A hidden gem overlooking Milwaukee’s theatre and entertainment district, Giggly (for short) will tickle the senses. Giggly will be the place to make every day a party – to “faire la fete.” A collection of champagne and international sparkling wines from the world’s finest vintners will be available by the glass and bottle, as well as a full selection of cocktails, beer and bar bites. An inviting wine list will take guests from sweet to dry and showcase different variations of sparkling wine, while the cocktails will highlight the fun you can have when pairing sparkling wine and spirits. You will be able to find some non-alcoholic fizzy lifting drinks and bubbly desserts, too! 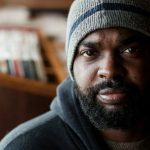 Community members, black-owned restaurants and BlankSpaceMKE have come together for the fourth year to showcase African American entrepreneurship and promote local businesses by hosting MKE Black Restaurant Week, April 14-20, 2019. Get more information about the restaurants participating here. 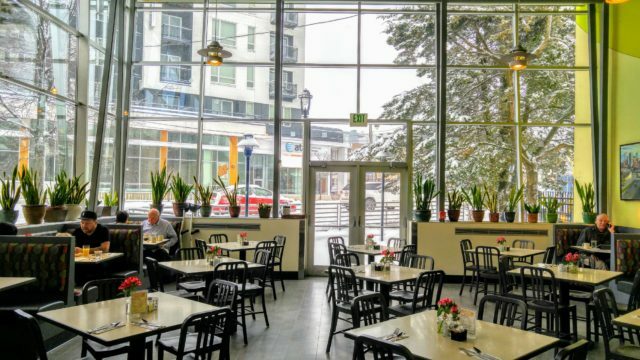 The Iron Horse Hotel’s restaurant, Smyth, will be closing in May 1 and reopening as a new restaurant. It’s still unnamed, but it’ll be created by the team behind many downtown restaurant like DanDan and Fauntleroy. We did get one clue: they’re putting in a hearth for wood-fired cooking. We can’t wait to see what that means. Thursday, April 11, Blue’s Egg in Shorewood will be hosting a dinner featuring wines from Gamba Vineyards and Winery, including its Etrusca Wines. Agostino Gamba, owner, grape grower and winemaker of this fine wine estate will also be there. Dinner will be prepared in collaboration between Blue’s Egg Shorewood and Story Hill BKC’s culinary teams, under the direction of co-owner Chef Joe Muench. Get more menu details and tickets here. 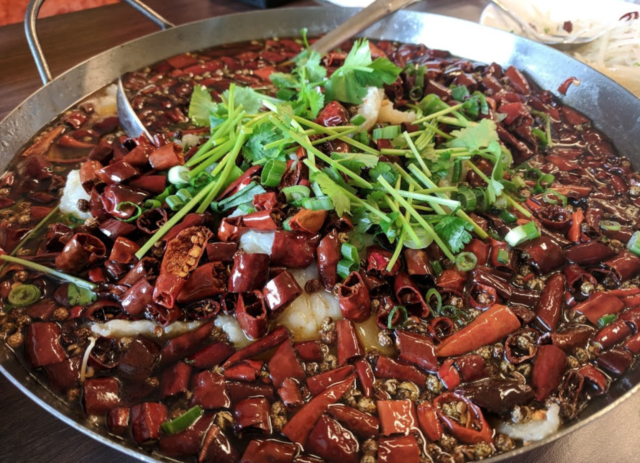 We love Sze Chuan because it is one of the only places you can get authentic hot pot in Milwaukee. This soup cooked at the table is hot in temperature and in spice. The rest of the menu features foods from the Sichuan province in southwest China, but also has a wide range of other Chinese cuisine. This is a restaurant where it is easy to get creative and build your own meal too. Holyland is well, the holy land of Middle Eastern cuisine in Milwaukee. It’s a store that sells all the spices, meats and dry goods you need to make a meal at home and its small counter service restaurant has some of the best shawarma, falafel and baklava around. Head to Indian Delight in Oak Creek for some delightful, fresh, affordable and meatless Indian food near Milwaukee. Try the thali, deep-fried samosas, chaats, pan-fried paratha and baked naan. Move over hot dogs, peanuts and Cracker Jacks…There are some new foods that you can get at a Brewers game in 2019. They include tamales, fried BBQ corn, Pete’s Pops, waffles and more. See the full list here. Teens Grow Greens’ annual chef dinner is coming up on May 30, 2019 at the Ivy House. This is always a creative dinner with fresh, local foods, top chefs and it benefits an organization that makes a difference for youth in Milwaukee. So save the date! We’ll have more information soon. “For bars, I like Beans & Barley, where I often see solo diners eating and reading; recently expanded Buckley’s, where there’s a new, small bar but it’s cozy and inviting; Elsa’s on the Park, which offers the bonus of great people-watching; and Bavette la Boucherie, which has an active solo-dining crowd, particularly at lunchtime – and no need to bring reading materials. With meal prep and butchery happening behind the counter, this place is a feast for the eyes. Speaking of things that Ann has written in Milwaukee Mag, we’re revisiting this article on the best fish fries in Milwaukee in honor of Lent. Check out her guide to the anatomy of the perfect fish fry and a list of the best restaurants with a fish fry here. Just as winter appears to be ending, Amilinda is doing a limited-time winter brunch series of warm comfort foods to get you through the last of these chilly days. It started in early March and runs through April 28. Take advantage of the seasonal specialties like torrijas (Spanish-style French toast), carcamusa (braised pork shoulder), the fried piri piri chicken and waffles, smoked salmon coca and more before they’re gone. See the full menu and get reservations here. If you’re curious about how to be vegan in Milwaukee, the fourth annual MKE Vegan Expo is your one-stop shop. It will take place March 30 from 10 a.m. to 5 p.m. The expo will be held in the UWM Student Union. Get more info on the events, speakers and more here. A good lager is underrated. They’re often overshadowed by IPAs, even though lagers are harder and show better beer craftsmanship. So we were excited to hear there’s a whole festival dedicated to this brew coming to Brew City. The Lager & Friends Festival features some of the best lager brewers in the country and celebrates the men and women whose passion, skill and technique go into creating these well-crafted brews. Experience it at Turner Hall Ballroom on March 30. In 2011 in Massachusetts, the Wahlberg family—chef Paul and famous actors Mark and Donnie—founded their first burger joint, called Wahlburgers. They’ve been expanding ever since. Now the fast food chain with the most hilarious name is finally reaching Milwaukee. Mark, Paul and Donnie Wahlberg, with their mother, Alma. 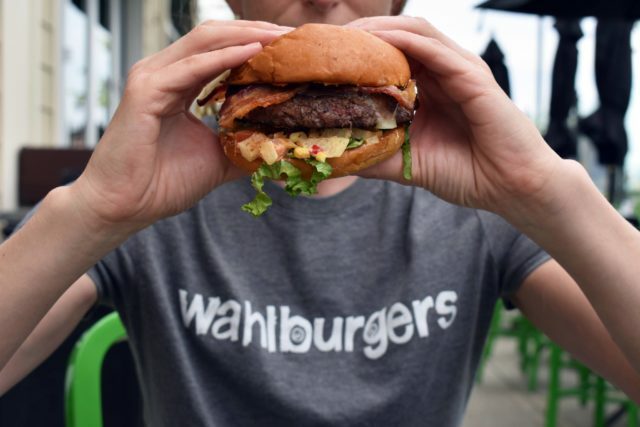 Two Wahlburgers are set to open in the area in 2019. One will be within The Corners of Brookfield shopping center and the other will be right in the Third Ward at 322 N. Broadway. Speaking of Ann’s writing, she finally did a story in Milwaukee Magazine this month that she’s been wanting to do since the first season of “Game of Thrones” came out. Check it out. Ann presents: The Game of Scones: Milwaukee’s 5 Best Scones, Ranked. It may come as a surprise, but Argentina is the world’s fifth largest wine producer. Though they may be under-appreciated by some, it’s not for a lack of quality. Want to see for yourself? Join Third Coast Provisions on Wednesday, March 20 to celebrate the diverse and stimulating food and wine of South America’s sleeping giant. Featuring a carefully curated selection of Argentinian wines and a one-time-only menu designed by their top-flight team of chefs, this is the perfect way to celebrate the first day of spring. See the menu and additional information here. 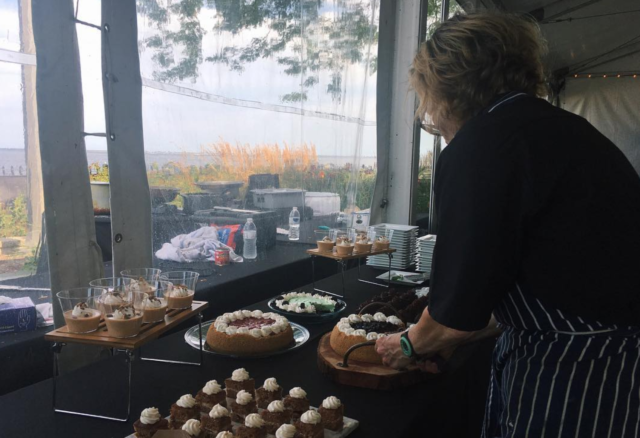 The Taste of Milwaukee is back on Thursday, March 21 with over 20 of the area’s best restaurants serving their signature dish and dessert samples. The event at The Italian Community Center should be a blast with live entertainment and a silent auction. Plus, it all benefits the Broadscope Disability Services. 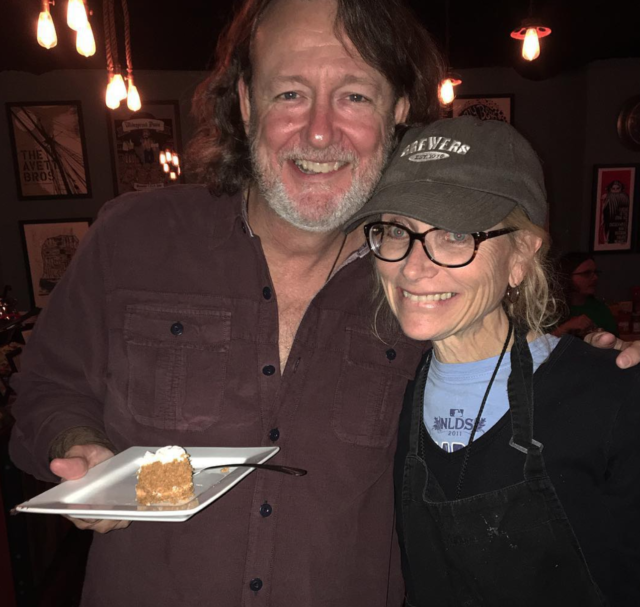 Julie Thorsen is the one of the most renowned, but underground pasty chefs in Milwaukee. That’s because she caters specifically to artists backstage at the Pasbt, Riverside Theater, Tuner Hall and occasionally at Summerfest. So unless you’ve performed there, you probably wouldn’t be able to try any of the treats she makes. She has a really interesting story that Ann brought us in March’s issue of Milwaukee Magazine. Thorsen originally had a career as a mechanical engineer with We Energies, until she got laid off in the early 2000s when the company was downsizing. After that, she decided to completely change her career path and attend Le Cordon Bleu in London to study pasty arts. There, she started giving her pastries away to actors at West End theater as a way to see shows. And after she received her certificate, she knew what she wanted to return to Milwaukee to do: bake for celebrities. Now, that’s exactly what she’s been doing for 10 years for the Pabst Theater Group. She’s baked chocolate mousse for Journey, pumpkin cheesecake for Thom Yorke, lemon bars for The National, personalized sugar cookies for Trevor Noah and a dessert spread for Mel Brooks so good he said he might love her. Follow Thorsen on Instagram to keep up with her latest treats for the talent that comes through Milwaukee. And pick up this month’s Milwaukee Mag to read the whole behind-the-scenes feature that Ann wrote about her. The last empty space in the Crossroads Collective food hall will be filled by a place called Raw Bar, a new seafood spot from the chef and owner of Morel in Walker’s Point. It will have seasonal seafood such as raw oysters, king crab legs, crab claws, shrimp cocktail and ceviche. But in sprite of the restaurant’s name, it won’t serve everything raw. It will also have sandwiches like a lobster roll a fresh tuna melt and soups like a lobster bisque and clam chowder. As for the decor, it will be inspired by the movies “JAWS” and “The Life Aquatic with Steve Zissou.” Raw Bar is slated to open in mid-March. On Thursday, March 21, Braise is putting together a four-course vegetarian based fermentation dinner with fermented drink pairings like kombucha, beer and wine. The first course is coffee kombucha glazed carrots with coconut kefir, roasted peanuts and baby kale. The second is spent grain cannelloni with braised rutabaga and mushroom, house chevre and oaked apply vinaigrette. Then there’s a shio koji fried celery root or koji rubbed beef ribeye with carrot kimchi and black garlic aioli. The last course is a peach vvass cake with lacto-fermented honey and brewer’s mash granola. Get reservations and more information here. Char’d is doing a new dinner concept on Sundays, starting on March 10. They’re offering a cultural dining experience centered around a traditional Korean home meal of rice, soup and “banchan.” These are little side dishes of different textures, flavors and colors. The goal of this type of meal is to stimulate the full range of flavor senses from sweet, sour, spicy, bitter and salty tastes and even try to incorporate as many colors in the foods as possible. Get reservations here. Hatched bakery is taking over Pilcrow coffee for the day to sell its signature pies. Tre Rivali is letting you have your pie and feel good about it too. They will donate 100 percent of all proceeds of their pie sale to Chefs Cycle: No Kid Hungry. Sunday, March 10 is the last day you can visit Chilango Express at 6821 W. Lincoln Ave. in West Allis. But this is not bad news! It’s good—the Mexican restaurant (one of our favorites) is tripling its size by moving a few blocks away to 7030 W. Lincoln, the old Sofia’s Italian restaurant. Not only will the new place have more tables, it will have a bar and an expanded menu adding items like chimichangas, fajitas and nachos. Soon it might even offer breakfast. The new location opens March 14, 2019. 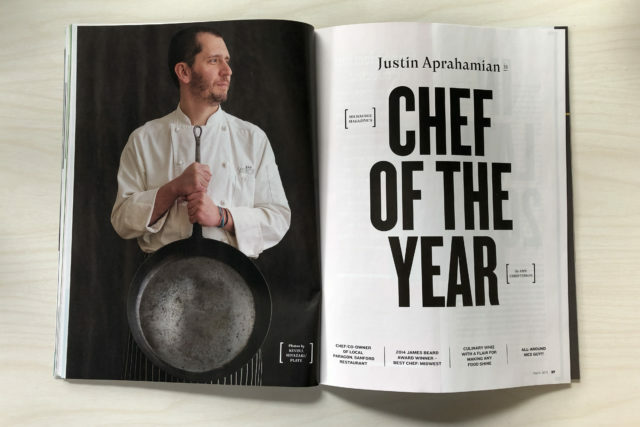 Ann picked Justin Aprahamian as Milwaukee Magazine’s first “chef of the year.” He is the chef and co-owner of Sanford Restaurant, a James Beard award winner for 2014’s Best Chef: Midwest, has made a huge positive impact on the city and he is just an all-around nice guy. She took skill, innovation, consistency and community leadership into consideration and Justin came out the winner. He’s been gracefully carrying the torch of the original Sanford owners, Sandy and Angie D’Amato, since late 2012. Anyone who has ever had a meal at Sanford knows that it’s an experience like no other in the city—and we’re not just talking about the divine menu. In her article, Ann calls the service “ballet-like.” And the tight ship all starts with Justin and his humble leadership of his charismatic crew with impeccable presentation. You can read Ann’s in-depth feature on Justin in this month’s issue of Milwaukee Magazine where he talks about his journey to where he is today and how Sanford is bigger than just him. Wednesday, the James Beard foundation announced the 2019 semifinalists for its awards that are like the Grammys of the culinary world. Five Milwaukee establishments and chefs made the cut: the Bartolotta Restaurants, Bavette La Boucherie, Bryant’s Cocktails, The Diplomat and EsterEv have all joined the James Beard Midwest competition. 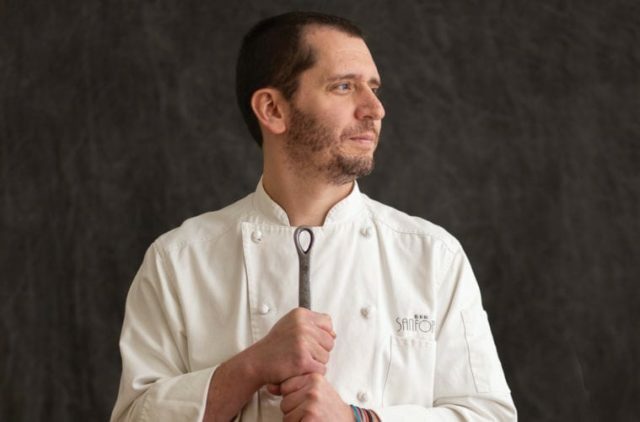 Also representing Wisconsin in 2019’s James Beard nominees is Chef Tory Miller’s L’Etoile, for Outstanding Chef and Jonny Hunter of Forequarter in Madison for Best Chef Midwest. This year we embraced the polar vortex, the snow and the cold. To reward us for our endurance and to get us all through the rest of winter, Snack Boys and Hotel Madrid are putting on an afternoon cookout like no other. Expect dishes like suckling pig, smoked brisket, half chickens, to whiskey galore and ice cold beer. They’ll be hosting at Hotel Madrid under a covered patio with heaters, fires and cocktails to keep you warm. You can learn all the secrets by chatting with the chefs in the outdoor kitchen while they roast, grill and char everything to perfection. Get more information here. Lately, you might be seeing a lot of promotion for Taste & Toast Milwaukee—but what is Taste & Toast? It’s kind of like Milwaukee Downtown Dining Week, but smaller. It features five (week)nights of special menus of bottles and bites, during the hours of 4-7 p.m. So basically, we like to call it the Milwaukee happy hour festival. It’s perfect to lift your spirits and satisfy your palate (and pocketbook) after work by sampling and sipping specially priced small plates, appetizers and mixers at over 20 downtown restaurants. The deals at all of these places are the perfect excuse and opportunity to go out every day this week to sample new restaurants, try places you’ve been meaning to go to for years or to revisit old favorites. Even the parking is discounted to $3. Check out all of the restaurants’ Taste & Toast happy hour menus here. Good City Brewing hasn’t been around that long, but they are expanding quickly. Their new location in the Bucks arena’s Live Block is huge and stylish. And its grand opening weekend is here. Get a list of the festivities, going on all day Friday and Saturday, here. While you’re drinking, check out the menu. Good City is known for their food as well as their brews. The new downtown location features staples from the original East Side taproom like the Impossible Burger, barramundi po’ boy, pilsner mac and cheese and the beloved curry fries. EsterEv, inside DanDan, is bringing its collaborative dinner series back from March to November. The lineup brings chefs from across the country together to cook cuisines ranging from French to refined Mexican to fine dining. Each date is a 10-course meal and reservations are required. First up on March 5, Chef Ryan Pfeiffer from Chicago’s Blackbird will be at EsterEv to offer his creative Midwestern cuisine using farm-fresh ingredients. We have more Milwaukee pasta news. Tua Pasta (meaning “Your Pasta” in Italian), a fast-casual pasta bar, is now in the works to open downtown at the former John Hawks Pub space along the Riverwalk. It will allow diners to craft their own pasta dishes– choosing from a selection of freshly-made noodles, sauces and locally-sourced toppings that will be cooked right in front of them. Tua Pasta will also serve made-to-order salads, gelato, beer and wine. Everyone loves a good supper club. The Landing at Hoyt Park did a Supper Club dinner on January 19, and it was such a good time, they are bringing it back for a second round. This second Wisconsin Supper Club dinner on March 16 in the cozy Grand Hall will invite Holly De Ruyter, the producer of documentary “Old Fashioned: The Story of the Wisconsin Supper Club” and Mary Bergin, author of “Wisconsin Supper Club Cookbook” to provide evening of history, entertainment and of course, a Wisconsin supper club fish-fry dinner and Old Fashioned cocktails. March 1, Camp Bar is opening a wine bar—Campsite 131. Named for its address at 131 N. Jackson St., Camp’s newest concept will have a slightly more upscale Northwoods theme with a long list of wines, but it’ll be just as cozy. Crossroads Collective has been open since December, offering soup, vegetarian fare, BBQ and more. And in March, it’ll be adding pasta to the lineup. Adam Pawlak, recent executive chef at Black Sheep in Walker’s Point, will be opening the Egg & Flour Pasta Bar in mid-March. Handmade is the key word. 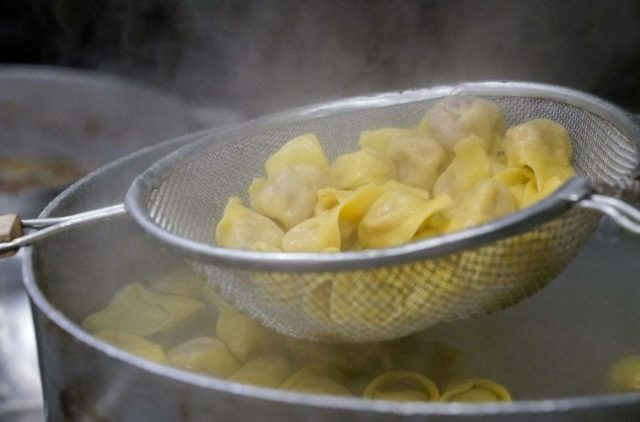 They’ll be making pasta from scratch every morning—like by putting dough through a handmade extruder to make linguine, spaghetti and rigatoni, or by hand sculpting pastas like ravioli and tortellini. But these traditional methods don’t exclusively come with traditional ingredients. Gluten free and vegan recipes will also be available. And they’ll include a range of fanciness, from mac and cheese to pasta Bolognese. Shanghai speakeasy and main bar – Brews from both Singha and Tsingtao and craft cocktails like “To Catch a Humming Pig” (two gins, housemade orange rosemary syrup, lime), “Hea-ting and Coo-li hing” (avagales silver, li-hing syrup, lime juice) and “Call me Xingfu!” (Tito’s vodka, passion fruit puree, tamarind). Fat Tuesday is also Pączki Day in Milwaukee. Pączki is a sweet Polish donut-like bakery item and here are the The Wisconsin Bakers Association’s Paczki Preview Party is the place to eat and celebrate the pastry. This event on Sunday, February 24 at the Polish Center of Wisconsin includes a “Paczki Passport” which gets you samples from each of the participating paczki vendors: Cranky Al’s, Grebe’s Bakery, Le Rêve Patisserie and Café, Neat-O’s Bake Shoppe and Sweet Perfections Bake Shoppe. Cafe Centraal in Bay View was closed for over a month to renovate and innovate. Now, they’ve reopened as Centraal Grand Café and Tappery. They’ve tripled their draft lines for the new and improved beverage program. And of course, these expansions include the menu too. Take a look at the new menu here, which includes a new snacks section, lots of friets and a weekday brunch menu. We can’t wait to try almost everything on here. February 24 from noon to 5 p.m., the Sherman Phoenix will be participating in a statewide celebration of this hashtag called #HealthierYou. Twisted Fork Vegan Festival is a free event, open to the public where vegans, vegetarians, omnivores and everything in between are welcome. And it’s a good chance to check out the Sherman Phoenix if you haven’t yet. At the Tapas & Amore event, minglin’ singles and lovers alike will be spicing things up in the midst of the winter chill thanks to the flamenco guitar sounds of Evan Christian and a Spanish-themed cocktail and tapas menu available in the Iron Horse’s Smyth restaurant, Branded bar and The Lobby lounge. It’s the perfect place to whisper “te amo” to the one you adore, or celebrate the season with your squad (and plenty of vino). 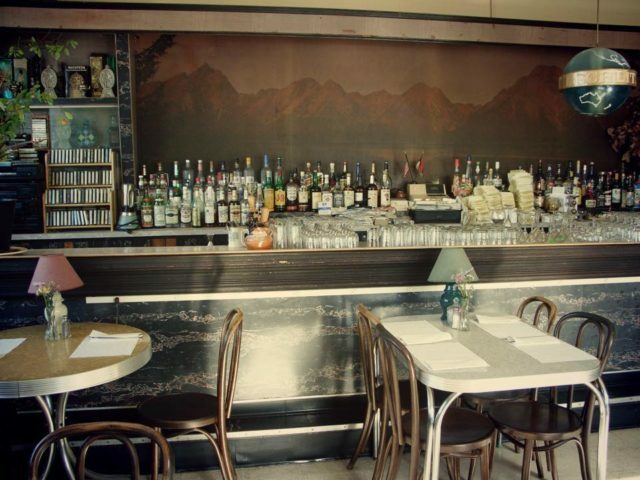 Bavette La Boucherie might be a great foodie date on February 14. It will have a special four-course tasting menu available in addition to the regular menu. The sweetheart specials include lots of oysters, scallops, roast quail and more. Seemingly combining the trends of food halls and food trucks, Milwaukee will be getting it’s own “food truck park” this spring. The owner of Mazorca is behind the new concept and has bought a lot and building in Walker’s Point to open Zocalo Food Park and Tavern. Jesus Gonzalez says the hope for Zocalo, which is the word for a public square in Mexico, is to create a similar gathering place by bringing in food trucks, a beverage program and even have room for parking, outdoor seating, live entertainment and games such as bocce ball and soccer. It’s Pho-bruary! This month, Thai Bar-B-Que, Bamboo and Vientiane Noodle Shop will be selling pho for $5 a bowl when you dine in. Usually it costs between $8 and $10. Though just because it’s on sale, doesn’t mean you shouldn’t tip your server. Dim Sum + Give Some is back this year as a gala. Monday, March 18 from 6:30 to 10 p.m. at the Italian Community Center, 15 acclaimed chefs from Milwaukee, from across the Midwest and as far as Colorado will be coming together to put on a six-course dinner to support The Kennedy’s Disease Association in honor Dan Jacobs of DanDan, who is battling Kennedy’s Disease. This cocktail party-style gala is sure to bring together good food and good drinks over a good cause.